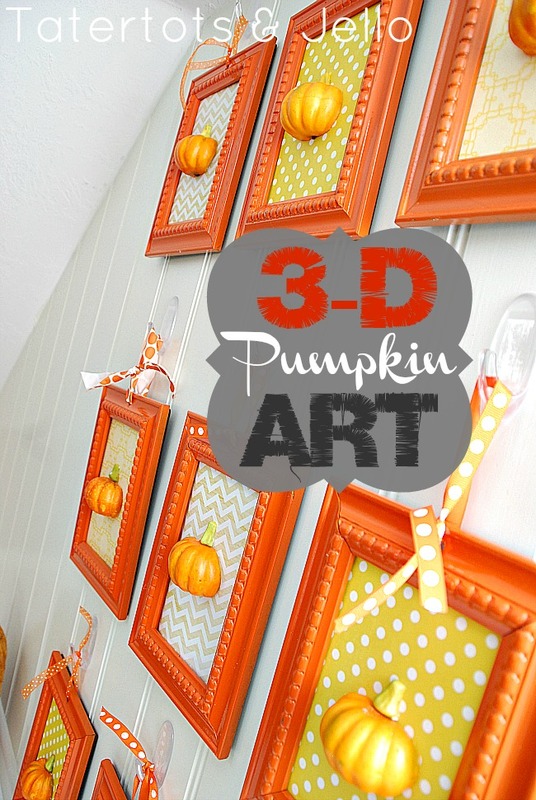 It’s Pumpkin Week — 3-D Pumpkin Art Wall! I’m having such a fun time with Pumpkin Week! I was thinking about it as I grocery shopped yesterday, and I wish Pumpkin Week could be Pumpkin Month. I have so many ideas — and not enough time to make them all. Thanks for stopping by for the fun! 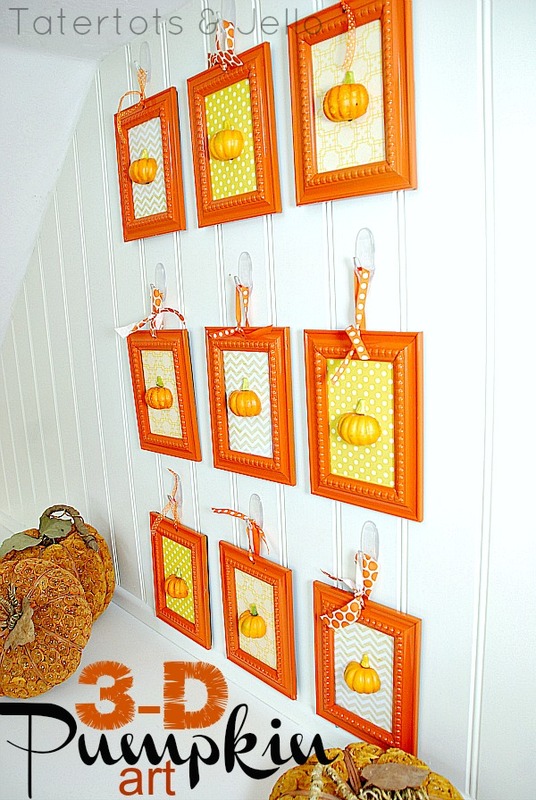 Here is a 3-D Pumpkin Art Wall I made. Command Strips contacted me in February and asked me if I would want to make 13 projects using the Command Brand products. I had such a great time thinking of ideas. This 3-D Pumpkin Wall was one of my favorites. I used 5×7 frames from the Dollar Store for this project. I drilled a hole at the top of each frame. And then I spray painted each frame orange. I used three coordinating papers for the wall. I cut out the paper and then alternated the paper in each row, so that each row had a different paper pattern. I had some small pumpkins I had bought at Target the year before. I took each pumpkin and cut it in half with an x-acto knife. Then I hot glued the pumpkin half to the center of the paper. Then I put some ribbon through each hole and tied it into a bow. The tricky part was figuring out the spacing on the wall. I took the number of frames and the space and then figured out how much space should be between each frame and each row. I made sure that each row and column had the same 2 inches between. I marked the place where the hook went, and then I attached a Clear Command Hook to those marks. 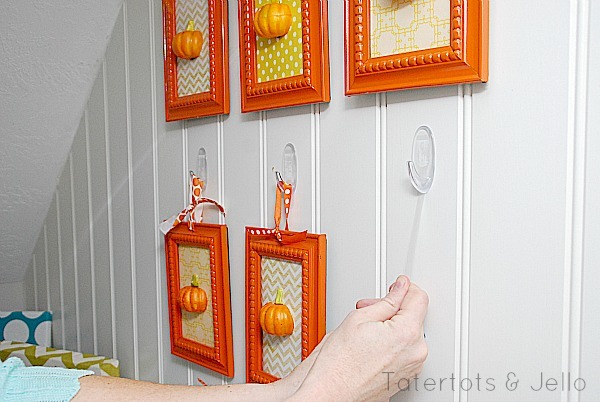 I love that I can take those hooks off of the wall when it’s time to decorate for another season or occasion. And you can buy replacement adhesive for the hooks. So you can reuse the hooks time after time. So there you have it — 3-D Pumpkin Art. 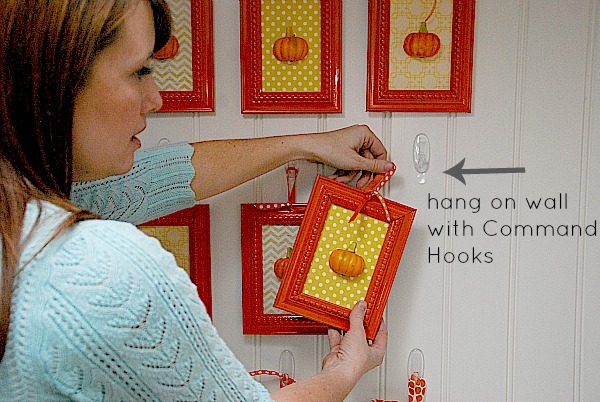 It’s a fun and inexpensive way to bring Fall festivity to your decor! 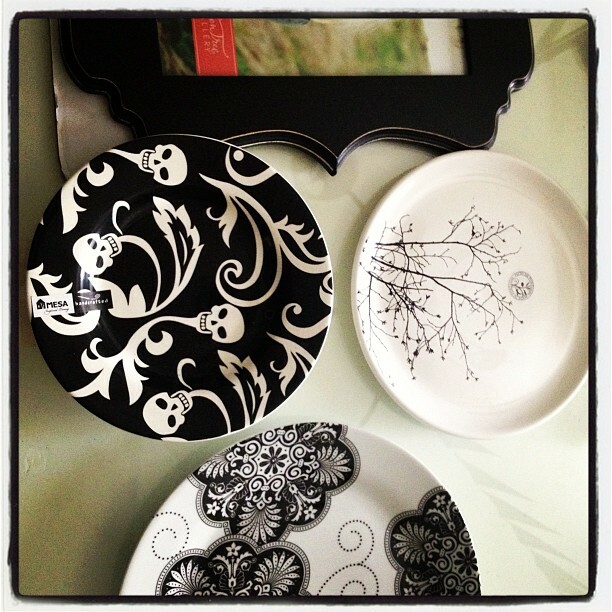 Do you love decorating for Fall?? Share YOUR Fall decor projects in the comments — I would love to see YOUR ideas!! 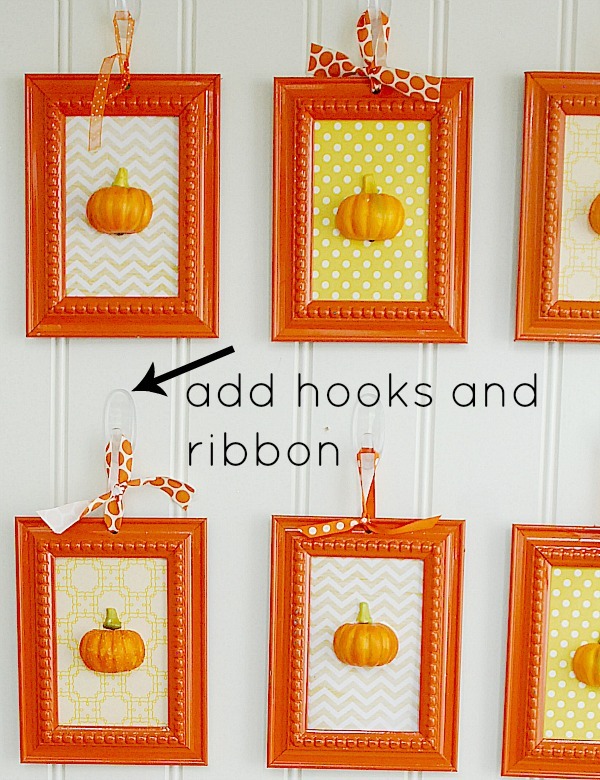 Great Ideas – 26 Pumpkin Decorating Projects! Hurrah! At last I got a website from wyere I know how to genuinely get uuseful facts concerning my study and knowledge. Love this idea Jen! Simple, yet fabulous! omg! cutest thing ever! 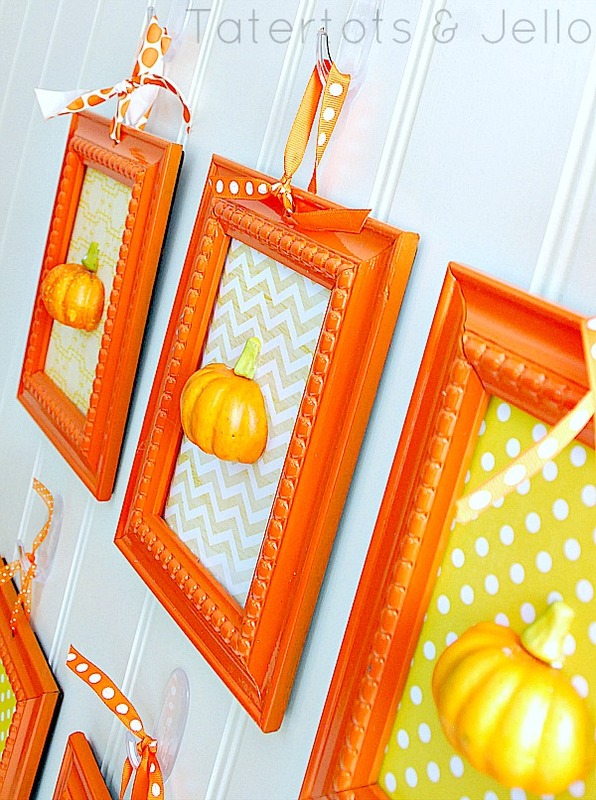 I am pumpkin obsessed and have been trying to find some cute, inexpensive fall decor ideas! LOVE! What about 9/11…not one moment of remembrance? I read this blog faithfully and I am shocked about the lack of REMEMBRANCE?? Hi Kim! Thanks for your comment. I do remember and I am certainly thinking about 9/11 today — I think everyone is. No one will forget that day. Thanks my friend!!! I hope you are having a good day. Seriously cute! My favorite part is that glorious deep orange color of the frames – what an impact! There is just no end to your creative streak, is there?! 😉 Love those peppy orange frames–so much fun. 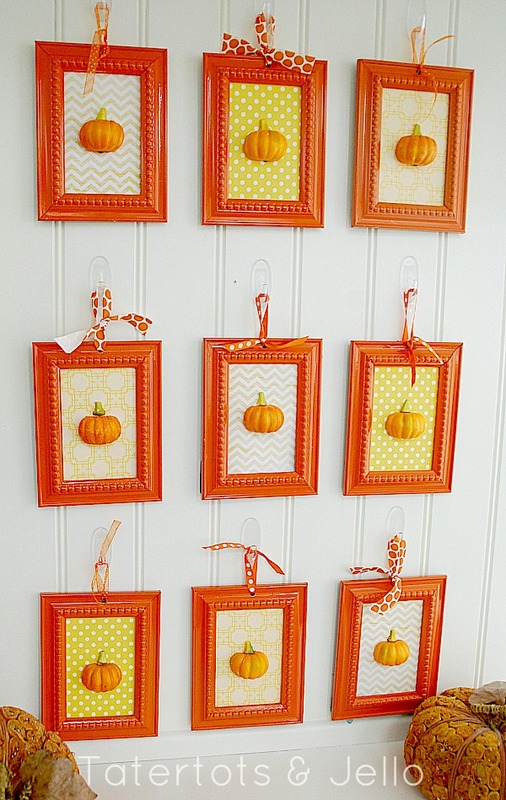 Great pumpkin gallery wall! OMG, I love that idea of the 3D pumpkins! Looks so nice, the whole collection of art.